At Froggies we pride ourselves on offering divers a friendly, relaxed atmosphere for divers of all levels. After diving, guests from around the world dine together, exchanging stories and enjoying the company of people brought together by a common love of nature and diving. 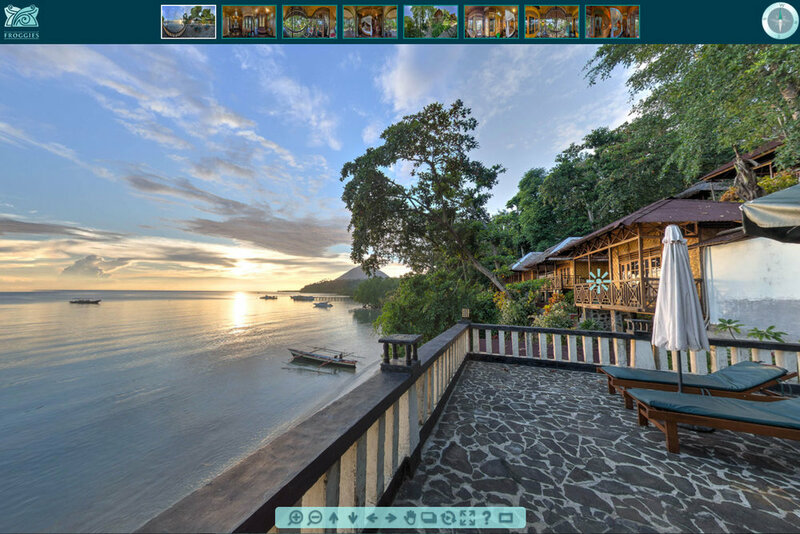 Explore Froggies Divers with our virtual tours by clicking on the pictures below. Located at the heart of the national park, Froggies Divers Bunaken gives you access to some of the best wall diving in the world. Let yourself drift along the coral covered drop-offs as turtles, tunas and the occasional shark swim by or have your guide show you the hidden world of macro life living on the walls. Located at the center of the Lembeh strait, Froggies Divers Lembeh is looking forward to make you discover the true meaning of “Muck Diving”. Whether you are an avid photographer or just an enthusiast observer, you will get the chance to meet some of the planet's rarest and most unusual creatures living in the black sand of the Lembeh strait. Fact: Manadonese people are very friendly. You will always be welcomed by a smile and you will notice very quickly that music and singing are part of the local culture. We embrace it while still offering the quality you may expect from a resort in our category. Our resorts being of modest sizes, we can easily offer flexibility. Should you feel the need to change something in our program or menu, you are most welcome to ask our staff. We will do our best to accommodate your needs. At Froggies Divers, you will always find at least one professional Scuba Diving instructor, should you wish to take your training to the next level. 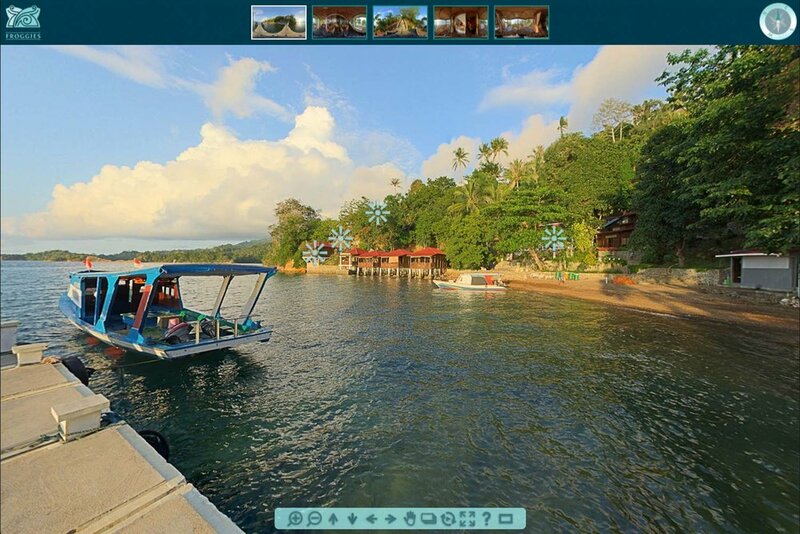 Our local dive guides all have hundreds, if not thousands of dives around Bunaken and Lembeh. They will make sure you have a memorable experience at Froggies Divers. 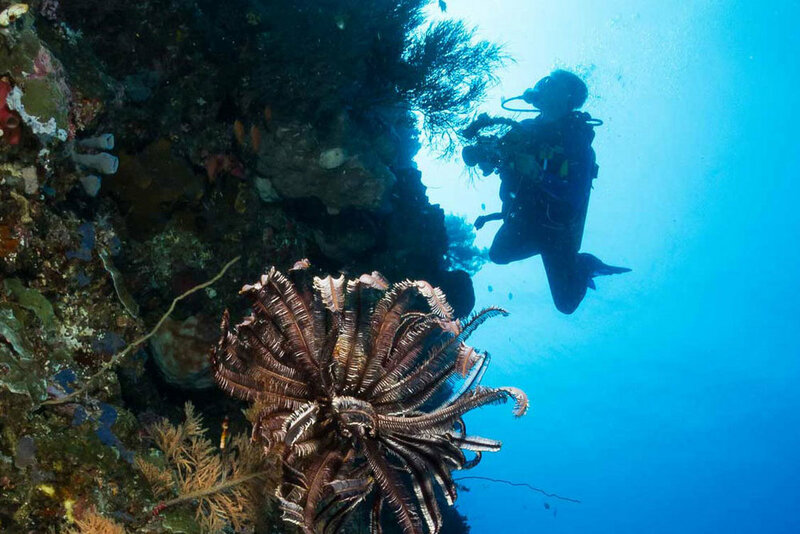 We offer up to four dives per day for the most adventurous divers. Should you prefer to spend the biggest part of your day resting or reading, feel no pressure. We offer flexibility over predetermined dive packages, giving you the choice of how much diving you want to do. Divers love Indonesia. The amazing diversity of life offers the chance to encounter some of the ocean's most beautiful, strange and colorful animals and corals. Located at the heart of the Coral Triangle, Froggies Divers has two distinct way to enjoy the natural beauty of Indonesia. The famous walls of Bunaken are teeming with life. 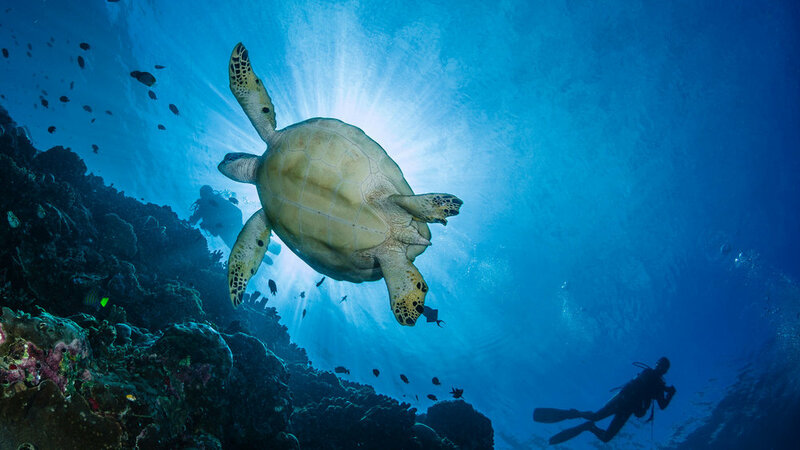 Long slow dives, following the current is the best way to meet turtles, napoleons, big jacks, sharks and of course, thousands of amazing reef fishes. It is also no secret that this corner of the globe is well known for being a macro paradise! Long, slow, relaxed dives are the best possible way to take in all of the beauty. If you have ever opened a dive magazine or browsed through some under water photography web sites, you undoubtedly heard about the Lembeh strait. The rare, the weird and the unbelievable creatures are the norm here. Each dive is a small treasure hunt and our dive guides will surely amaze you. Most dives are long and shallow with extended safety stops. If you are looking for a wealth of comfort set up in the cozy bungalows, then Froggies Divers is the perfect place for you. Froggies' bases are ideally located and the most famous dive sites are only a short boat ride away. Our restaurants feature delicious meals prepared with fresh, local ingredients. Our meals are mostly inspired by the local Indonesian cuisine. We are happy to accommodate guests requiring a particular diet for personal, religious or medical reasons. Prior notice is appreciated. There is only one international flight arriving in Manado from Singapore with SilkAir (with a 30kg baggage allowance), three times per week (Mon, Wed, Sat). There is, however, a broad choice of domestic companies if you come from Bali, Jakarta or other major Indonesian cities. It takes about 30 minutes by car and from the harbor, another 50-55 minutes by boat to Bunaken. Our Resort is just a few steps away from the main jetty. Please, note that it is not possible to navigate between Manado and Bunaken at night for safety reasons. The drive to Bitung harbor takes about 90 minutes. There, our speedboat will take you to our resort in a short 10 minutes. Transfer between our two resorts can be arranged with ease. It usually takes about three hours door-to-door. For your enquiry please use the form below, or send us an email to: froggies@divefroggies.com. We will contact you as soon as possible. Froggies Divers Copy Rights 2016.